Launched exclusively for the Chinese market in 2018, Justice is a popular action MMORPG based on a famous novel by Woon Swee Oan. The story was also adapted for TV in 2004 and is well known throughout China. Justice is developed by Netease, who has worked closely with NVIDIA to produce the Justice RTX demo. This demo is designed to demonstrate what RTX can bring to their in-house game engine. 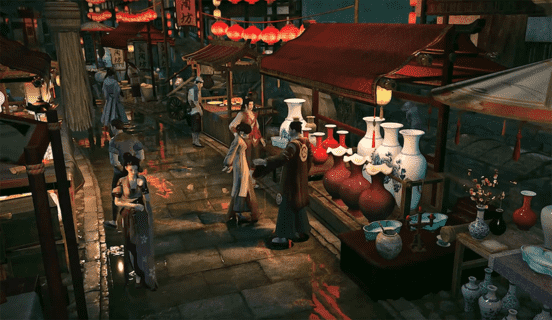 Ray tracing is used for the reflections and shadows seen in the demo, including caustic water reflections (shimmering light from water), which increases the level of immersion throughout the traditional Chinese town. These ray-traced reflections add depth and make for a more cinematic experience when compared to screen-space reflections. Justice RTX demo also has NVIDIA DLSS, which uses the power of AI to boost frame rates so gamers can use higher resolutions and settings while still maintaining solid framerates. This demo application has these available options: 1920x1080, 2560x1440, 3840x2160. First, set the windows native resolution to the desired demo test resolution, and set the display scale and layout to 100%. Click the Justice batch file named run.bat and select Ray Tracing and DLSS options in the launcher, then click OK. Note that 1920x1080 resolution also works for this demo, but DLSS is disabled as an option. DLSS requires the Tensor Cores available with NVIDIA RTX cards. If you want to run a performance test, please make sure G-SYNC and VSYNC are all disabled in the NVIDIA Control Panel.